With Vodafone mobile WiFi you won’t have to take any chances with WiFi connectivity on the go. If you rely on WiFi connectivity for work or like the idea of being able to access online content and check your emails wherever you go, Vodafone mobile WiFi is the perfect solution. This slim, lightweight device is no bigger than the palm of your hand, meaning it’s effortlessly portable. Whichever mobile WiFi device you choose will act as a Vodafone portable WiFi hotspot, allowing you to access a 4G internet connection without using up your phone’s data. These ingenious devices even allow you to roam free in 50 destinations at no extra cost, or pay just £5 a day to use your home plan in 60 roam-further destinations. You'll only be charged on the days you use your device. 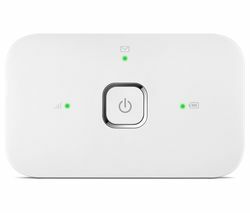 If you’re a relatively light internet user, a Vodafone mobile WiFi device can also come in handy as a great alternative to regular home broadband and is perfect for locations without an existing internet connection. You can even spread the love and share your WiFi. Using the Vodafone mobile network to create a portable WiFi hotspot, you can securely access the internet and share the connection with others. You can connect up to 10 devices, including laptops, tablets and smartphones, making it a great option for a group. Available on a recommended tariff of £30 per month for 50 GB of data, this beautifully simple device could be the answer to your mobile connectivity dreams. We also offer an EE mobile WiFi devices and an selection of mobile broadband solutions from other providers. See all USB dongles in our collection to browse a choice of easy, pre-loadable options.